Releasing a new book in a series is like going all-in at poker: the bet has to pay off or the rest of the series is doomed to commercial failure. So I thought I’d share out some of the nail-biting with a progress update. A few minutes ago, I sent the final draft version of the Kindle book to Amazon. If you’re in the Recon Team, but haven’t finished the book yet, that’s fine. If you still have fixes and suggestions, I can add them later on, although from this point I’m going to have to argue much harder to convince myself to make changes. The Kindle edition is on pre-order until June 6th, which is D-Day for me as I will go into action with more promotion. If you’re thinking of ordering but haven’t made up your mind, get the pre-order now as the price will go up shortly after June 6th. There have been 506 pre-orders to date. That’s better than Marine Cadet had done by this stage. 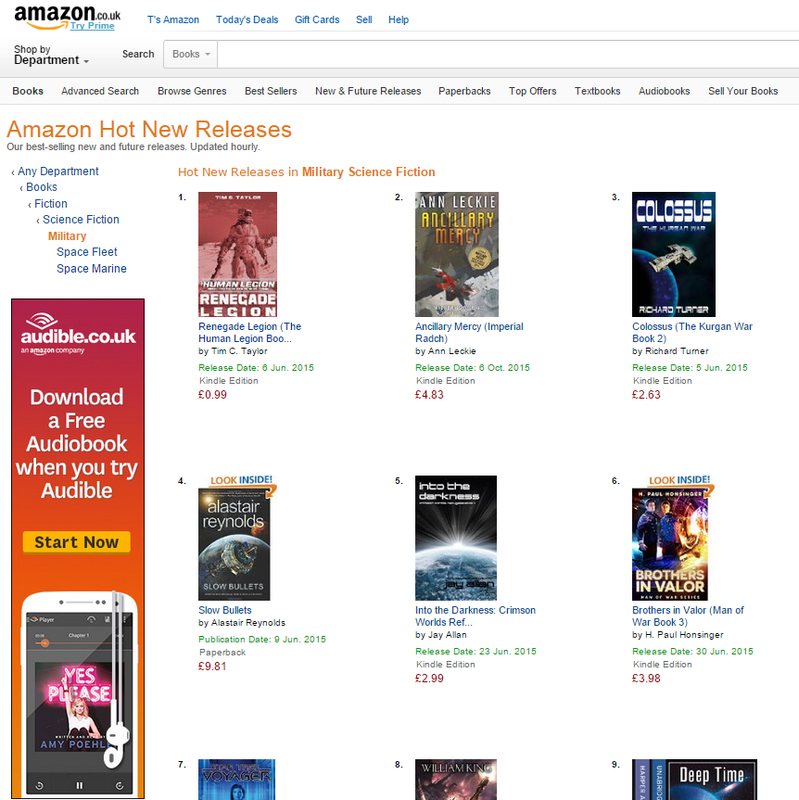 I’m delighted with how the UK pre-orders are going (see the screenshot). The situation in the US is much less impressive so far, but it’s still early days. There’s all to play for! While the book succeeds or fails commercially on the basis of Kindle sales, I’m proud of the paperback edition too. It’s waiting for what I hope to be the final proof copy. I made some last-minute tweaks to get the spines to line up nicely across the series. The paperback will most likely be available a few days before the Kindle. You will be fine, the books are amazing so people will buy them!!! I do think that you should get a better web presence, though I don’t know where to start on that one.